AntiGravity® Yoga is a fusion system that builds bridges between fitness and elements of yoga practice. This fresh and fun system is inspired by levity and its very philosophy is to have fun whilst remaining aware. 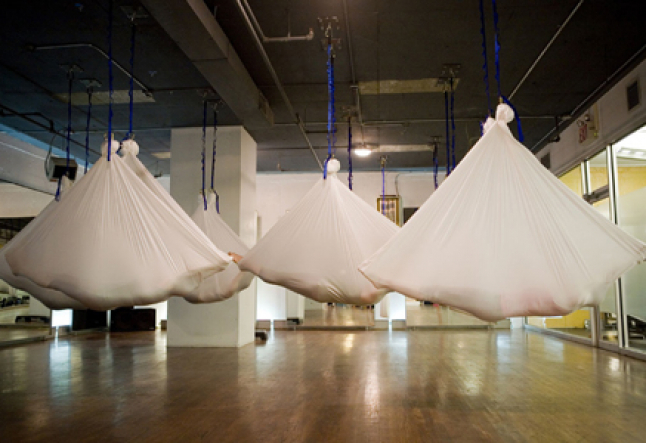 Cocooned within a silk hammock, the participant carries out various physical disciplines that are inspired by artistic sports and aerial arts. Consciousness is the key to this practice. As it combines these beautiful artistic based movements, with a blend of both the physical quest of yoga along with the mental discipline yoga requires, thus encouraging awareness of the body with the clarity of the mind. This style of inversion therapy allows the body to feel free by creating a lighter existence by zero-compression playful practice, which literately and metaphorically teaches us how to fly. In each class, one trains to be more flexible, mobile, stronger and agile in an environment based on playful and joyful energy. AntiGravity® yoga is the brainchild of Christopher Harrison, a former gymnast, dancer and truth seeker. Evolving from an acrobatic performance company and the discovery into the benefits to the spine through zero-compression inversions, AntiGravity® was officially launched as a technique in NYC in 2007. It is now growing across the world of fitness and yoga studios. The benefits, albeit a few, include: muscular strengthening, stimulation to the neurotransmitters to the brain, hydration to the vertebral discs, hormone stimulation and self-esteem enhancement. AntiGravity® yoga is a great way to have fun, feel fit, lift your spirit, help posture and feel lighter. Its benefits to the body, blend of yogic principles and artistry is completely inspiring. Yoga teacher training and franchisee opportunities are available, check out the website for further information on this and your closest location.